Walking around the East Village, I have been spotting at least a couple of fine real-life specimens of Tintin's constant companion Snowy (Milou in French, ? in Dutch). This inspired me to look up Snowy's breed, which turns out to be the wire fox terrier. 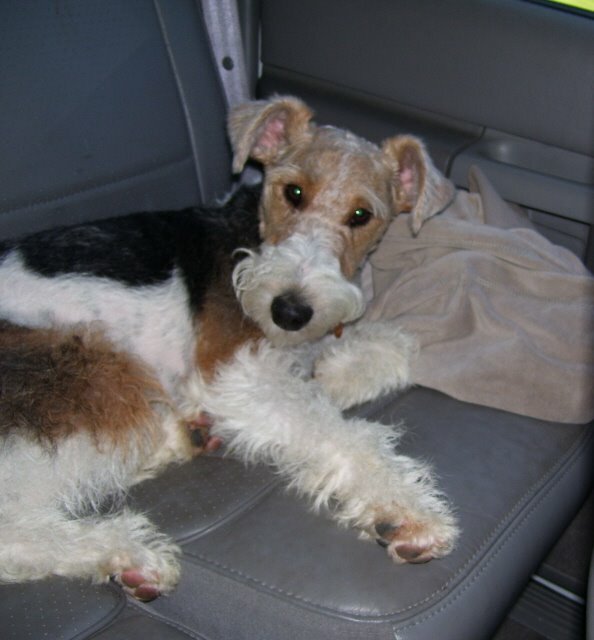 While I would love to get a dog once we arrive in Brussels, wire fox terriers do not appear to make the best pets. Wikipedia observes that "Among the less desirable traits of all fox terriers are their energy, digging, stalking and chasing of other animals, and yelping bark." Basics: "[He] is Tintin's four-legged companion who travels everywhere with him. The bond between the dog and Tintin is deeper than life, and they have saved each other from perilous situations many times." Linguistic and paranormal abilities: "With a few exceptions, Snowy never speaks (although he is regularly seen thinking in human words), since he is 'only a dog' . . . . Snowy often adds to the story in many interesting ways. For instance, Snowy is the only character in Flight 714 to remember that he was abducted by aliens." Alcoholic tendencies: "Like Captain Haddock, Snowy is fond of Loch Lomond brand scotch whisky, and his occasional bouts of drinking tend to get him into trouble, as does his acute arachnophobia." Evolution of the character: "The character of Snowy . . . was most dramatically affected by the introduction of Captain Haddock in The Crab with the Golden Claws. Before Haddock's appearance, Snowy was the source of dry and cynical side-commentary, which balanced out Tintin's constantly positive, optimistic perspective. When Haddock entered the series, the Captain took over the role of the cynic, and Snowy gradually shifted into a more light-hearted role, serving to create comic relief by chasing the Marlinspike cat . . . , drinking the Captain's whisky, etc." Many of us in the wire fox terrier community cringe at that Wikipedia entry. Those traits mentioned are breed attributes. Wire fox terriers? Delightful, playful, independent, magical and .. wordy. We are some of the very first dog bloggers around. Wikipedia... it's true what they say: "It's the people's 'pedia." As the proud happy owner of TWO wire fox terriers. I ask that you not refer to something like wikipedia but instead ask the people you see with the wires what they think of the breed. My dogs and this breed are alot of things but stalking and a yelping bark is not one of them. Their energy I admit is high and you know what I LOVE that about them. They are a prey driven dog but that's what they were created for. But their undying love for you and their total devotion to you is unwavering. Not to mention their sense of fun and love of life is down right contagious. So again before you quote or refer to wikipedia please check other sites and ASK those that own that wonderful breed why do you own it? A true wire lover will tell you so much about that breed you'd ask forgiveness for that quote. We are two wire fox terriers who live in South Florida. We are surprised at your taking for granted what Wikipedia has to say about our breed. Every dog knows that Wikipedia is not the last word on anything as it can be edited at will by those without the proper understanding of a topic. So, let us tell you what our humans think of us: adorable, inquisitive, irresistible, fun-loving, sure to make them laugh in moments of stress -- and most of all -- really smart!!! Yes, we do bark -- but you would too if you saw the world the way we do!!! We have our own blog, if you want to see for your self. I'll say . . . Thanks to Gimlet, Jake, Just Harry (and Ozzy and Romeo's mom) for their valuable input. None of the dogs I know are quite as outspoken, which may account for my ignorance.